Where to stay - Our conveyance - Disappointed at our ride - Glenwood, the Half Way House, the Rip Van Winkle House, the Mountain House - Arrival at the Laurel House - Our Reception - The Kauterskill Falls - The Scenery, etc. Having a short vacation, and desiring a relief from the cares of business, I concluded after due deliberation to make a trip to tbe Catskill Mountains. This being our first visit we were somewhat at a loss to make up our mind what particular locality to choose as our resting place, and being besieged on all sides by runners and agents innumerable upon arriving at Catskill, our ideas became confused for a time, but we came to our senses and concluded to take tbe advice of tbe gentlemanly agent of tbe Laurel House, and visited that particular resort. We passed through the bustling throng of carriages of all kinds from an old style post coach to a rickety lumber wagon, and were on our way. Our conveyance was a splendid Concord coach drawn by four rattling steeds, driven by one "Tom," as we were informed, who knew his business as we soon found out, and was courteous and agreeable to all under his charge. time of our departure until we arrived at the Laurel House. After leaving the village of Catskill, which is situated on a bluff above the noble Hudson, and which contains many first class hotels, restaurants and private residences, we passed over a splendid road built years ago, ascending a ridge of land and lime rock which extends from Hoboken, New Jersey, to the St. Lawrence river, (as we are informed) falling back from the Hudson at places on its line north, and forming numbers of ridges with valleys equal in number clothed with verdure equal in appearance to any to be found, interspersed with numberless fine farm houses, with all necessary out buildings, the farms appearing to be under a good state of cultivation and the owners and occupants seeming to be joyous and happy. After a five mile ride we arrived at Glenwood, where a halt was made for rest, water, &c. A mile further on we halted at the place familiarly known as the Half Way House, where more refreshments for man and beast were obtained. We then proceeded on pur journey to the foot of the venerable Catskills, said at this point to be 1,000 feet above the tide waters of the Hudson.' Proceeding from thence we commenced the ascent of the mountain, which coupled with the invigorating air and the beauties of the scenery on either side and the valley below we forgot time. Arriving at the Rip Van Winkle House another halt was made, and upon enquiry we found we stood upon the identical spot where the venerable "Rip" was wrapped in slumber for twenty years. We viewed the spot and enjoyed the scene which we had often witnessed in drama presented to millions, by the artist, "Joe Jefferson." After a short halt we proceeded on, arriving at the summit where stands the Mountain House, we took a look at the valley beneath which is about 3,000 feet below. Proceeding on, we soon arrived at the popular resort — the Laurel House — kept by mine host J. L. Schutt, and were received with kindness by the proprietor, the numerous guests of the house seeming to join in the welcome of our appearance. Once within we were shown to a well furnished room where we were to make our headquarters during our brief sojourn, and after making a hasty toilet we were ushered into the spacious dining hall where a bounteous supper was provided with all that heart could wish and to which we did ample justice, as the air had sharpened our appetite to an unusual extent. After satisfying our inward cravings, we proceeded to view the outside world by moonlight, and were well pleased and retired to our room, our rest only being disturbed by pleasant dreams of the future. In the morning we arose refreshed, and after our usual walk partook of a hearty breakfast, feeling invigorated in body and mind, and proceeded to take a survey of the place. Now, Mr. Editor, we are no professional tourist, for if we were we would give you a description of the place, but suffice it to say, we have taken our meals and rest regularly since, and lost no Interest in the place; neither have we been misled by the proprietor or those in his employ. We cheerfully recommend the place to all tourists as being a quiet home with all the comfort of cool air, walks and drives. The Kauterskill Falls are nature's wonder — the Infinite and finite are combined, holding the spectator with awe and reverence as he viows the scene. No lovelier spot can be found, as we believe, on this continent. Gentle reader, if you think we are biased, we advise you to take a trip and satisfy yourself. The proprietor will be found affable; and for quiet, secluded walks, for the comforts of home, for good substantial board and genuine human treatment we venture the opinion that it cannot be surpassed on the American continent. A Freeman reporter took a run up to the Laurel House Monday. He started on the noon train at the Junction, and reaching the Laurel House after a pleasant ride about 2:28.- This was done notwithstanding the fact that owing to the West Shore train being behind time, the train on the Ulster& Delaware Railroad did not leave the Junction until nearly half an hour behind time. That this half hour was almost entirely made up on the run on the Ulster & Delaware and Stony Clove and Kaaterskill roads, shows how like clock work everything is run. The return trip on the train which leaves the Laurel House station at 4:51, after a two hours sojourn at the Laurel House, was a delightful one. If the reporter had wished he could have driven from the Laurel House, to the Hotel Kaaterskilll and had a good look at both places, with ample time to return on the same train. The train reached the Junction, about 6:50, the schedule time. A very fine trip, therefore, can be taken by a person to these mountain resorts during an afternoon, and much can be seen at slight expense The great expense attached to mountain trips by home people are hotel bills. By running up and back the same afternoon nothing is expended except railroad fare, and when excursion tickets are bought this is comparatively light, counting the many miles traveled. Unlike traveling on other railroads, the ride on these roads is very pleasant. some one good-bye, are often of a sufficiently stagey order to be interesting. Business men in this city can take trips to those places in the mountains, without interfering very much with the work of the day. The Laurel House is situated in a delightfully cosy retreat. It is but a step from the Laurel House station. It is well equipped in every respect. It can accommodate 250 people, and has at present about 216 guests. Mr.J. L. Schutt, the proprietor, might indeed be called the pioneer of mountain house men in this region. He can show registers, containing names of many eminent people, as far back as m 1827. Mr. Schutt's father located at this place in 1825. He did not keop a register until he had been there two years, and to leaf over some of the registers of names of the boarders of olden times is interesting. Among these names can be found that of the graceful writer, Washington Irving. Now the later register contains the names of President Arthur and General Sharpe. President Arthur was so delighted with this place, that he paid two visits to it while stopping at the Kaaterskill House. The house at present is different from what it was in the old days. It was then a small boarding house (that is it would now be considered very small) though at that time it was thought to be of goodly size. The present house is built in the modern style of mountain houses, the roof of the deck running all around on the three sides, the roof of the piazza being on a level with the dormer windows of the roof of the building itself. The building is three stories in heighth, with a mansard or French roof on the top. There is a large observatory in the center, from the top of which an American flag waves. precipice several hundred feet in height. The water falls at the foot of the ravine, and then swiftly rushes away over the rocky boulders down the Kaaterskill Clove toward Palenville. To reach the bottom of these falls are a number of staircases. There are 300 steps. Here and there are landing places where the tired individual coming up can rest before finishing his climb. The falls is a beautiful sight the present season, as a large quantity of water is flowing over it. Cut in the rocks at one place is an inscription regarding the suicide of a dog, which leaped from the platform down into abyss below. Looking over an old history of the State of New York published about 1822, the following description of these falls aro given: After stating that the stream flows from two lakes each about a mile and a half in circumference it says: "After a west course of a mile and a half, the waters fall perpendicularly 175 feet, and pausing momentarily upon the ledge of a rock, precipitate themselves 85 feet, more, making the whole descent of the cataract 260 feet. Below this point the current is lost in the dark ravine or clove through which it seeks the valley of the Catskill. The water fall with all its boldness, forms however but one of the interesting features of the scene. From the edge of the first falls is beheld a dreary chasm whose steep sides covered with dark ivy and thick summer foliage, seem like a green bed prepared for the waters. Making a circuit from this spot and descending about midway of the first fall, the spectator enters an immense natural amphitheatre behind the cascade, roofed by a magnificent coiling of rock, having in front the falling torrent, and behind it the wild mountain dell over which the clear blue sky is visible". The novelist Cooper probably gave the most beautiful description of this Falls, putting it in the mouth of Leather Stocking. Said Leather Stocking: "But the hand that made that leap never made a mill! There the water comes crooking and winding among the rocks, first so slow that a trout could swim in it, and then starting and running just like any creature that wanted to make a far spring, till it gets to where, the mountain divides like the cleft hoof of a deer, leaving a deep hollow for the brook to tumble into. The first pitch is nigh 200 foot, and the water looks like flakes of driven snow afore it touches the bottom; and there the stream gathers itself together again for a new start, and may be flutters over 50 feet of flat rock before it falls for another hundred, when it Jumps about from shelf to shelf, first turning this-a-way and then turning that-a-way, striving to get out of the hollow, till it finally comes to the plain." Mr. Schutt Is a venerable man, with a long white beard. He is courteous and agreeable to his guests, and a perfect representative of the old time hospitable, generous-hearted whole-souled landlord. Thousands of people visit his house, and the falls during the summer. It is one of the curiosities of the mountains. While the Freeman reporter was there, which was about two hours, at least a dozen large mountain stages filled with people, besides many private carriges drove up to the door. The Laurel House is only a little over a mile from the Hotel Kaaterskill, and one and a half miles from the old Catskill Mountain House with good mountain roads to each. The State Stenographer's Association opened its session at the Laurel House on Tuesday, to continue Tuesday and Wednesday. It was expected a large number of stenographers would be present. It is feared their regular business meeting will be remarkably short. When these stenographers got through climbing down and up the 300 steps of the Kaaterskill Falls and the steep pitch of the Haines Falls, they will need two baggage men and a stretcher to each stenographer to get them outof the woods. A first class FAMILY HOTEL, having all modern improvements and conveniences. Send for circular. THE LAUREL HOUSE - CATSKILL MOUNTAINS, N. Y. At the head of KAATERSKILL FALLS. This hotel will be kept OPEN UNTIL NOVEMBER 1. Special attention to cuisine and warming the house during September and October. Best drainage in the mountains. Rates from $10 to $20 per week after September 1. Direct railroad access from Roundout to the Laurel House Station, or from Catskill to Mountain House Station, where stages meet all trains. Landlord of the Laurel House. years before the war, back ia the fifties, when the old House with big, open fireplace in the office and the large Franklin in the parlor drew a select crowd of visitors in the fall of the year. Then some of the most noted of the New York artists used to gather about the fire at night and listened to the stories Mr. Schutt would relate of his adventures in the woods. Year after year in October, Sanford R. Gifford of Hudson, Jervis McEntee, W. W. Whittredge and others of less note made the Laurel House their headquarters, and this was kept up until the new house was built and the cosy character of the place had departed. Since then the great hotel has steadily grown in popularity with summer guests, and for many years past Mr. Schutt and his charming wife, by their courteous and winning manners, continued to add largely to their circle of friends. The death of Mrs. Schutt was a heavy blow to her affectionate husband, but it was borne with heroic fortitude. Mr. Schutt was an ideal landlord, one of the old school, who made the comfort and happiness of his guests a study. His generosity and tenderness of heart was prominently shown by his liberal aid to those in need, and many recipients of his bounty will miss his pleasant greeting and outstretched hand that was never empty for those in need. His faults were few, his virtues many, and the memories that cluster around the Falls and the old house will ever include as the central figure that prince of landlords — J. Louis Schutt. The Laurel House, Catskill mountains, has a name and fame abroad that makes almost anything connected with it seem like household affairs. The recent death of its proprietor J. L. Schutt, caused the place to change title, but it is with pleasure that we state that L. P. Schutt has arranged to control the property and conduct it as in the past. 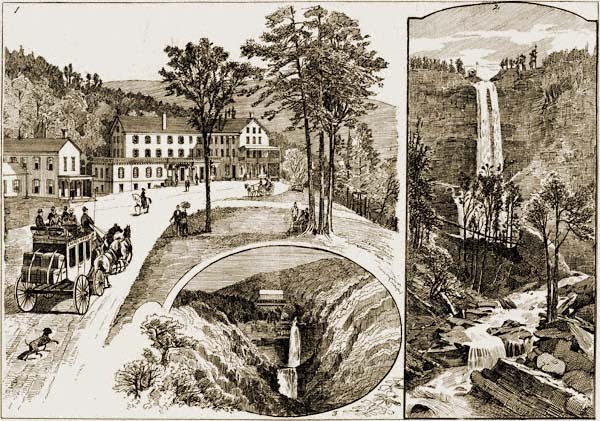 No one who may visit the Catskills will enjoy the scenery or mountain hospitality unless they give Mr. Scutt and the Laurel House and the Kaaterskill Falls a visit. Jacob Fromer, of Tannersville, has purchased the Laurel House and Kaaterskill Falls for $36,785. The arrangements made for leasing the Laurel House to Captain Mandeville, of New York, have fallen through with and the property has been leased J. R. Palmer, proprietor of the Palmer House at Lakewood, N.J., on the same conditions that Captain Mandeville negotiated for. The house will be conducted by Palmer & Collins. The Stony Clove & Catskill Mountain Railroad is now in excellent shape having just been re-balasted and fitted up for summer travel. The road is an excellent one and the employes are civil and polite, always willing to assist the passengers in any way and never tiring in their attention to the wants of the patrons of this well-equipped mountain railroad. Under management of J.R. Palmer of Palmer House, Lakewood, N.J.
New York office, 26 Cedar St. Hundreds Are Fighting to Save the Lauel House and Kaaterskill from Forest Fires. Caught in Mountains, Their Retreat Cut Off, One Perishes and Other May Die. Climbed Up Steep Cliff with Burning Timber All About Them. CATSKILL, N. Y. Saturday.— Menaced by a fierce forest fire which has ranged about here for two days, the management of the Laurel House, on the mountains near here, have a force of a hundred men stationed about the hotel to-day ready to fight back the flames should they draw closer. The fire has approached within 300 yards of the hotel, and some of the patrons have left, but the management announced to-day that the house and its patrons were safe enough, as every precaution was being taken to keep the flames from gaining any further foothold. At the Hotel Kaaterskill the same precautions are being taken. The fire has now burned over a district of several hundred acres. The woods are intensely dry and the trees burn like tinder. No one knows how the fire started, but it spread rapidly, and farmers and residents for miles around turned out to fight. Of these fire fighters one young man now lies dead, his body burned to a crisp, and another is suffering from terrible burns and is delirious. It is feared the shock of his experience has rendered him so. A force of three hundred men from Tannersvllle and Haines Falls had been fighting the fire, and Frank Layman and Oscar Ford were among them. They reached the bottom on a steep ledge of rocks, near Kaaterskill Falls, when they found themselves suddenly cut off by the fire. There was nothing left but to climb to the top. That was the only way by which they could hope to save their lives. They started on an awful journey up the jagged face of the cliff, their hands and feet cut at almost every step by the sharp stones. The flames were so close that the clothing of the men was scorched, but they struggled on desperately. Ford at last reached the top utterly exhausted. He crawled a few feet into a place of safety and then fell in a dead faint. Layman was only a few feet behind him. The hair was singed from his head and his clothing was on fire. He had Just reached the edge of the shelf of rock that meant life to him when he fell back into the flames below. When the fire had passed that section of the forest a searching party found Ford and took him to Haines Falls where he lives. Layman's charred body was found some time afterward where he had fallen. The fire has as yet touched no buildings, and it Is believed that unless an adverse wind springs up it will burn itself out in the mountains, with no damage to the hotel property. CATSIILL, N. Y., Aug. 13.—Several hundred men who yesterday and last night fought forest fires which threatened the big mountain hotels Kaaterskill and Laurel House, eventually got them under control and today tbe hotels seemed to be out of danger. Frank Layman, one of the fire fighters, perished in the flames and Oscar Ford was frightfully burned. OPEN JUNE 10, 1905 under new management. HAINES FALLS. GREENE CO. N.Y.
Haines Falls P. O., Greene Co., N.Y.
Brooklynites Scattered Throughout Mountain Villages for the Summer. Haines Falls, N. Y., June 7— In 1823 Peter Schutt came to Haines Falls and soon afterwards erected a log cabin which, because of the picturesque scenery surrounding it, became one of the famous mountain resorts of the world. In 1850 Mr. Schutt built the Laurel House, which had a capacity of twenty-five guests and which has since been enlarged so that today the Laurel House, the original house at Haines Falls, has a capacity of over 200 guests. In 1864 the late Charles W. Haines, famous the world over, constructed the Haines Falls House, which then had a capacity of thirty guests. At this time the Laurel House and the Haines Falls House were the only resorts in this section, and yet the fame of Haines Falls had reached every place In the world where the English language was spoken. The beauty of the falls at the Laurel House which, by the way, are the highest waterfalls in New York State. and the delightful scenery of the beautiful Palenville Clove, made this section the haunt of famous artists and writers. The season here commences in May and extends well into October unless it becomes too cold for comfort, and Haines Falls has never known a dull season. This section is the home of summer golf, which, at an elevation of over 2,200 feet, becomes the sport of kings in reality, and as the links here are unusually good, there is more interest in golf at Haines Falls than at any place in the Catskills. LAUREL HOUSE Laurel House Station. Accommodate 300. 13th Season. Reasonable Rates. There have been a number of changes in the management of hotels and boarding houses, notably at the famous Laurel House, where A. C. Inglessi has been succeeded by E. Stlllman; at the Vista, where Miss A. Ely has been succeeded by E. B. Haines, and at Fern Rock, where William Miller is succeeded by Perk & Shlfren. Laurel House Sation, Haines Falls. N. Y. "Pete" Schutt was born in the hotel business. He first saw light in the Laurel House, Catskill Mountains, N. Y., June 13, 1886. He is descended from old Dutch stock, settlers who came to the Hudson River valley before the Revolution. "His great-grandfather, Peter Schutt, kept a celebrated inn at the famous Kaatersklll Falls, in New York State. This property was handed down to, and enlarged by "Pete's" grandfather, J. L. Schutt, who, until his death in 1889, was a widely-known landlord and host in that section. "L. P. Schutt, "Pete's" father, conducted business many years until in 1898 he associated himself with the Flagler system of hotels in Florida. L.P. Schutt has been in Florida ever since, at present being manager of the Casa Marina, at Key West. "The three sons of L. P. Schutt received their hotel training under H. E. Bemis, present manager of the Royal (Polneiann) at Palm Beach, beginning at the bottom. George, "Pete's" older brother, now is manager of the Long Key Fishing Camp, one of the Flagler system hotels at what is probably the most famous fishing grounds in the world. Frank, a younger brother, is manager of what is said to be the South's finest hotel, the Peabody, at Memphis, Tenn, and "Pete" has been selected to manage Tampa's largest, the Florldan. "Pete" Schutt himself is an ardent sportsman. While In Fort Myers he collected an enviable assortment of shot guns and rifles as well as fishing tackle, both of which he is expert in handling. He has won many medals and trophies at traps, and boasts the distinction of having taken the world's largest tarpon. This tarpon stuffed is now on exhibition at a Tampa sporting goods store." "A great and noble heritage, proudly accepted and confidently carried down through many generations, is not often evidenced in these days of diversified occupation. So many times the son of a great father selects other fields, and the achievements of a great man die with his generation. But for one family of hotelmen there is an eminent exception and a reversion to the olden times when sons followed their fathers, attaining equal success and perpetuating a family name in achievement in a chosen and respected vocation. That famlily name is Schutt - and of the present generations, a father, mother and three sons make the name synonmous with "Success." "L. P. Schutt, the father, is manager of the famous Casa Marina Hotel at Key West, Fla., a unit of the Florida East Coast Hotel Company Group — the Flagler System. The oldest son. George Schutt, is manager of the Long Key Fishing Camp at Long Key, Fla., another unit of the same system. Peter Schutt. second son, is manager Of the beautiful Hotel Charlotte Harbor at Punta Gorda, Fla. and the youngest son, Frank R. Schutt, is manager of the Hotel Peabody in Memphis. Tenn."
This is the introduction to a laudatory article in the May number of the Southern Hotel Journal, which includes concise biographies of the members of a Greene county family of whom we in the home territory are as proud as are the numerous friends they have made during their business careers in the South. The Hotel Journal article recites that about the year 1800 Peter Schutt built the first hotel in the Catskill Mountains, and as the resort business expanded he established himself at the head of the famous Kaaterskill Falls (in 1823,) where he was succeeded by his son J. Lewis Schutt, built the Laurel House and conducted it successfully until his death tn 1890. During this period his son Louis literally served an apprenticeship in the hotel business, which he mastered so thoroughly that he laid the foundation for an enduringly successful career. All three of his sons have followed in their father's footsteps, under his tutelage, and that their training was efficient is shown by their attainments in their chosen walk in life, where their future success in unquestionably assured. "There is something inspiring in the records and accomplishments of the Schutt family — something extraordinary in the Way in which they have upheld the heritage left by that remarkable forefather, Peter Schutt. They are born hotel-keepers, true friends to those who know them, and real hosts in every shading of the word." Besides their three sons, Mr. and Mrs. L. P. Schutt have a daughter (Lulu), Mrs. R. L. Bow of Miami, Fla. Passenger service on the Stony Clove branch of the Catskill Division of the New York Central railroad will be discontinued April 26th. Passengers for Laurel House, Haines Falls, Tannersville and Hunter will be carried from Saugerties by busses operated by the railroad. It is expected that this arrangement will reduce the time of the trip to any of these stations by about an hour. Mrs. Minnie Gardner Schutt. widow of Louis P. Schutt, veteran Florida and Catskill Mountains hotel man died Saturday night, after an illness of about two weeks. Mrs. Schutt, who had for several years made her home at the Saulpaugh Hotel, Catskill, was stricken with a heart attack November 4, and suffered a stroke from which she failed to regain consciousness at the Memorial hospital, Catskill. Born in Columbia county, in Oak Hill (now Greendale) 82 years ago. Mrs. Schutt passed her 82nd birthday in April of this year. Funeral services were held at 3 o'clock this afternoon at the Haines Falls Methodist church. Burial was in the family plot in the Haines Falls cemetery. She married Louis P. Schutt, son of the late Mr. and Mrs. Jacob L. Schutt, proprietors of the Laurel House, at Haines Falls, in May, 1881, and after the death or Mr. Schutt. Sr. in 1889, Louis P. Schutt took over the management of the Laurel House. They also managed Twilight Inn at Twilight Park, Haines Falls. Mr. and Mrs. Schutt's fame as hotel hosts was not only in this locality, but in Florida, where for many vears he managed the Long Key Fishing camp and the Casa Marina hotel, at Key West, Fla. REASONABLE RATES. ASK FOR ILLUSTRATED BOOKLET. MR. & MRS. L. CARELLA, PROP. The Laurel House at Haines Falls, one of Greene County's most famous resorts of 50 years ago, is staging a comeback this season under the ownership and management of Mrs. Virginia Cardinal and Mrs. Millie Carella. The two women, who last year purchased the big hotel and hundreds of acres of surrounding property, report that their first season was very successful and that the prospects this year are even better. The huge white structure is being thoroughly renovated at heavy expense and additional improvements are planned for next year. Once a gathering place for the social leaders of the nation, the Laurel House had been empty and unused for several years before its new owners took over last year. The new cocktail lounge on the lower level, just above the spectacular Kaaterskill Falls, is another innovation, complete with new bar and snack bar. A feature of the latter attraction is a bright and shining pizza oven, which is probably the only one of its kind in this area.